Research shows that fighting depression with exercise is a legitimate option to manage the symptoms of depression. This is critical information if you have treatment-resistant depression, or want to get off of medications. Studies show that exercise is indeed medicine for the body, mind and soul. Exercise is not a depression cure-all. But, a new study published in the Journal of Sport and Exercise Psychology found that exercise promotes happiness. More physically active people reported greater general feelings of excitement when compared to less-active people. Exercise may also reduce stress and help you get a better night’s sleep. That’s why your favorite fitness routine can be an excellent addition to your depression treatment plan. The question is which workouts work best in fighting depression with exercise? The answer is whatever gets you moving! Can you walk? Start walking 30 minutes to an hour a day. You prefer to run? Then run! Rowing, swimming, weightlifting, tennis, whatever it is, get moving! Get out of your home and get moving. A couple of years ago, I met a man who asked me if I could call a childhood friend of his and help him out of his depression. Immediately I said yes, and called his friend. The man told me that his friend had wasted away in his apartment for over 15 years. He began to experience major depressive symptoms during and after his divorce and estrangement from his only child. I understand the pain of both and implored him to consider just a walk every day, just to get outside of the room he had sat in for over a decade. He did not want to. He said several times, maybe , but at the end of the day, he did not want to move. He did not want to get up and start moving physically and metaphorically beyond his pain. I explained to him how much just moving would help him, but it was to no avail. Unfortunately, as far as I know, he continues to take medications and continues to suffer over a past that cannot be changed and over a present that is not what he wanted. As I said to him, so I say to you and myself, just get up and get moving. It does not matter what exercise you do, but at the least start walking and for strength I like to suggest squats, deadlifts and push ups as well. Why Push Ups for Fighting Depression? As opposed to squats and deadlifts, you do not need a gym. You also do not need to have weights and a power rack in your home. Gym equipment in an apartment is not too practical, and even in a home is not always possible. For example if your basement or garage has a low ceiling, now what? But, as long as you have a floor or carpet, you can do push ups. Can you fight depression with push ups? I say yes, and I am not the only person who fights depression with the simple push up. Look at this article how exercise affects your mood from the Black Dog Institute, an pioneer in the identification, prevention and treatment of mental illness. A Canberra man who has fought a battle against depression is doing 3,000 push ups in three hours to raise funds for the Black Dog Institute and awareness of major depressive disorder . I doubt that 3,000 push ups is a realistic number for most of us. But, why not shoot for a bare minimum. I like 100. Whatever you like, 100 or 1,000, you will definitely feel better! Bill Lockley will undertake his challenge from 6:00am to 9:00am on Thursday 17 November at the corner of Martin Place and Elizabeth Street in Sydney, Australia. “I love push ups and I hate depression, so doing one to fight the other was a natural fit,” Lockley said. “All year I’ve been engaged in a running battle against depression. I've had good days and bad days, but one thing that always seemed to help me keep the black dog at bay was getting regular exercise. I can only confirm and agree with Bill Lockley's statement. Keeping the black dog of depression away is a lot easier by getting regular exercise. Push ups are not the only way, but all you need is yourself and a floor, what is more convenient than that? Even if you can only do one push up, start there and gradually increase your push ups. When I started doing push ups, I could only do one. As your body gets stronger, so will your mind. “It was a self test from the Black Dog Institute that convinced me to seek further help earlier this year, so I wanted to do something to help them reach others struggling with depression. “I know that exercise can have a very positive effect on people experiencing depression. 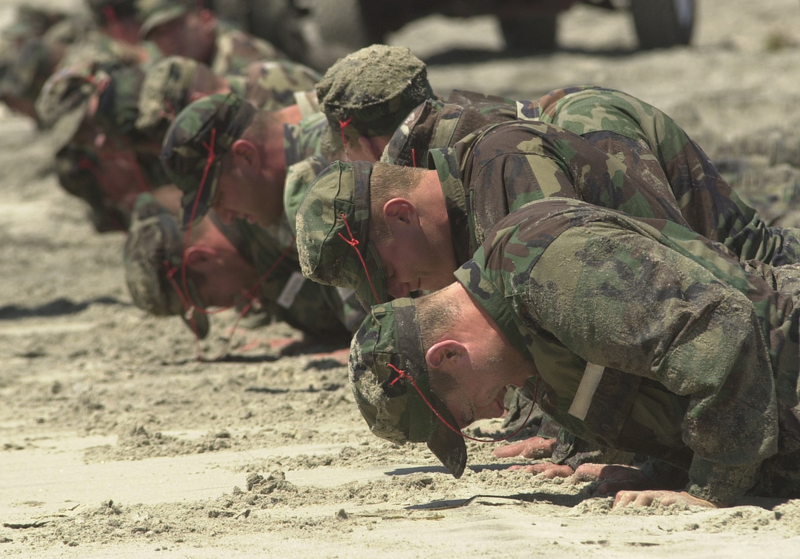 Doing 3,000 push ups in three hours is how I choose to get exercise, but if you aren’t quite up to that, there are plenty of other ways to let exercise lift your mood. Around one in five Australians will suffer from a mood disorder in their lifetime. For some people it will be an isolated occurrence. However, the reality is that for many people, it will be an ongoing challenge throughout their lives that will also impact loved ones around them. The Black Dog Institute is a not-for-profit organisation helping people who are depressed and by undertaking this initiative we know we are helping those affected to enjoy a normal life. The Institute has an international reputation for its outstanding research while at the same time operates a clinic for people with mood disorders at its Randwick facility as well as extensive community programs and education and training for health professionals. David Hawkins has suffered from serious depression since the age of 18 but now, aged 50, he is getting his life back on track thanks to the Village Farm Health Club and Spa in Shilbottle. And in the process he’s shed an incredible nine stone ( 126 pounds ), which has been a further massive boost to his confidence. David, of Lealands, said his struggle to cope began towards the end of his teens. Like so many other people fighting depression, David went to his doctor and was prescribed medication. But while it stabilised his emotions, he found it having an increasingly negative impact on his life as time wore on. “After many years of taking many different kinds of antidepressants for mood swings and anxiety, I was finding that the medication was making me feel like a zombie, that my personality was being drained away,” he said. “I managed to shift a lot of weight over the course of a year, but because of the ongoing depression, I stopped going to the gym and I put six stone ( 84 pounds )of it back on again in just a few months,” he says. “I was desperate, but I knew I had to get back on top of things. “They have also helped me to take a more balanced approach to weight-loss by making small, gradual changes to my lifestyle and so far I have kept the weight off. As a result, I feel much fitter and more stable. I have a general feeling of health and wellbeing. Get more social interaction. Exercise may give you the chance to meet with others. Just exchanging a friendly smile or greeting as you walk around your neighborhood can help your mood. There are many other studies which corroborate and support the anecdotal evidence of many people who have lifted their depression through exercise. If you want to get more fit, end obesity or fight depression, start a push up workout program. See 23 Things I Learned From Doing 100 Push Ups a Day at 62 Years Old. Here is how to do 36,500 Push Ups this year. Depression is a nightmare for anyone who is in its grip. Not only for you, but for your family, friends and coworkers as well. You need options for fighting depression. Fortunately studies around the world show that exercise is as effective against depression as medications. You have choices besides medications, even the simple push up is an effective alternative. You can do the push up anywhere and get leaner and stronger just from push ups. Besides the body transformation provided by the benefits of pushups, now you know how push ups are also a great tool for fighting depression and anxiety disorder. What do you think are the best alternatives for fighting depression without medications? Do you have other suggestions? Did you ever use aerobic exercise or bodyweight exercise like push ups to fight depression?